This project focussed on the environment, in particular the visual and sonic effect of renewables on the southern Indian landscape and how this can be represented through contemporary art. It examines renewable energy and its use in the Indian environment, which are crucial to India’s long-term energy strategy. Objectives included documenting the evolving landscapes and developing artwork as a response. 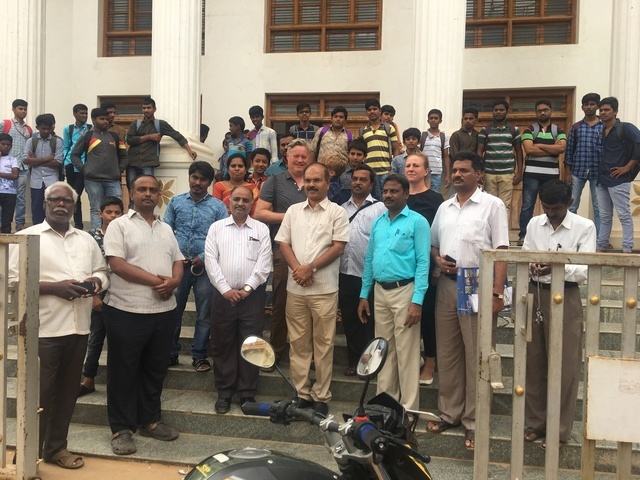 It builds on ongoing cross-disciplinary art/science collaborations with Prof KPJ Reddy at the Indian Institute of Science and founder of the ground-breaking Dr H.N.S. Centre. The Centre has various enclaves focussing on areas of science or arts and humanities and brings together national and international researchers with young people from rural communities. Visits to relevant sites were undertaken such as dams and solar plants and documentation gathered in the form of photographic, sound and video recordings and on-site drawings. These will form the basis of further practice-based research focussing on the changing landscape and the visual impact of energy sources including wind, hydro and solar. There was considerable press interest in this project including articles in five newspapers and TV coverage in 9News. There were a number of contacts made including being a guest of the Minister for Agriculture and both the President of the District and Head of Education visited the project. Links were also developed with local and Bangalore artists as well as the art school in Bangalore.